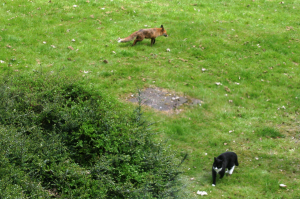 Observation - fox and cat - UK and Ireland. Description: Cat sees off Fox, Cat keeps his stash of rabbits, squirrels and various other under Bush to left, fox checks out stash twice a day, but got caught out, he'll be back!! Cat sees off Fox, Cat keeps his stash of rabbits, squirrels and various other under Bush to left, fox checks out stash twice a day, but got caught out, he'll be back! !